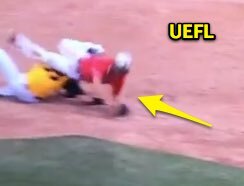 A bona-fide/force play slide rule double play at second base and violent home plate collision at Iowa's high school State Championship tournament are today's Ask the UEFL subjects pertaining to what is legal vs interference vs malicious contact vs obstruction. Play 1 - Force Play Slide Interference Ends Game: Harlan Community High School defeated Waverly-Shell Rock Senior HS 7-6 in the state semifinal following a slide interference ruling at second base. With one out and one on, Waverly-Shell Rock's batter hit a ground ball to Harlan's shortstop, who threw to the second baseman for the force out at second base, and onto first base as Waverly-Shell Rock baserunner R1 slid into second base, resulting in contact with the middle infielder, ruled interference by the 2B Umpire for a game-ending double play. e) Runners tries to injure the fielder. Furthermore, a legal slide requires at least one leg and buttock to be on the ground and the slide must put a runner within reach of the base with either a hand or a foot. Question of the play: Who has run into whom? Analysis, Play 1: There are two video replay angles we will consider here: the first is from the television broadcast or mid-home press box camera, and the second is from field level beyond the third-base dugout. The press box camera suggests the runner satisfied all criteria of NFHS's 2-32-2 except the requirement in a legal slide for at least one buttock to be on the ground. That said, when the runner begins his slide, the second baseman has just tagged second base and is now moving down the baseline between first and second base, toward first base and into the runner. At this point, it would likely be most practical to consider whether the runner's slide was legal at the point at which the fielder began the play at the time when the runner began his slide, relative to whether the runner's buttock made contact with the ground before arriving at second base, or whether it would have had the fielder not made contact with the runner. The NCAA rules book contains an excellent diagram for the Force Play Slide Rule, delineating where a fielder is and is not protected by rule. 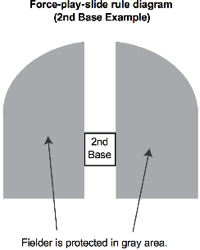 As suggested by the accompanying graphic—which shares similarities to NFHS in that the fielder is protected in the gray area although NFHS itself doesn't use the diagram in its rules book (for one, there should be gray area beyond the base, as in NFHS 2-32-2c)—the second baseman is not protected from a hard slide that occurs directly in the baseline between first and second base, unless the slide is otherwise illegal. It sure appears the runner remains within the baseline between first and second base and, thus, is legal in that regard. To determine the extent of any further legality, we must turn to our second camera angle from the stands beyond third base. Replays indicate the fielder catches the throw and begins his play to first base while even with the front edge of second base, and that he hops towards the runner as he prepares to throw to first base. Camera 2: Did R1 intentionally twist into F4? Replays also indicate that while the slide appears more vertical than horizontal, the slide's trajectory isn't part of the rule, unless one were to interpret this as a rolling slide (albeit without much of a roll). Instead, we look at the runner's legs and cleats (both on the ground), while bearing in mind that the runner twists as he makes contact with the fielder; either way, one buttock does contact the ground prior to the point at which he would have contacted the fielder had the fielder not jumped toward the runner. Is R1 attempting to pop-up? That's also illegal. This can be interpreted in one of two ways: either the runner is attempting to protect himself from the collision, in which case the slide is legal, or the runner is attempting to alter the fielder's throw with a hard quasi-rolling slide, in which case the slide is illegal and interference should be called. If, as the second image indicates, the umpire deems the runner to be attempting a pop-up slide into the fielder, interference would be the proper ruling. Because it's a force play, if the FPSR rule is invoked, the batter-runner is also out. Play 2 - Obstruction or Malicious Contact: Here we have Wilton High School batter-runner Cory Anderson attempting to complete an inside-the-park home run as he encounters Denver High School catcher Kain Eagle standing in his way without the ball. A wild collision ensues. Who is at fault? The Rule, Play 2: A catcher in high school is ordinarily treated like any other fielder when it comes to obstruction, which occurs when "The fielder without possession of the ball denies access to the base the runner is attempting to achieve" (2-22-3). NFHS 3-3-1m states that it is unsporting to "initiate malicious contact on offense or defense" and that malicious contact's penalty shall be ejection from the game, an immediate dead ball and automatic out. NFHS malicious contact is officiated as interference (2-21-1), but has no precise definition. The 2014 NFHS Points of Emphasis suggested "intentional excessive force" or "intent to injure" as possible considerations for malicious contact, but NFHS generally leaves the matter open to interpretation. In this case, we have a runner who looks to lower his shoulder into the catcher in an attempt to push through a fielder who is plainly obstructing his pathway to the next base. The only question then is, with a fielder who has obstructed a runner and a runner who has interfered with a fielder by virtue of malicious contact, which violation shall take precedence? 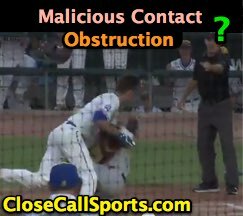 Refer to Rule 8-4-2e for a simple solution: "Malicious contact always supersedes obstruction." NCAA also has a flagrant collision rule, but this only applies when the catcher actually has the ball. In sum, although OBR has a plate blocking rule that NFHS doesn't, this is because NFHS doesn't need a plate blocking rule: it already has a penalty for obstruction or malicious contact interference as the case may be. Analysis, Play 2: This one is pretty simple, at least from the cheap seats. The catcher obstructs the runner, after which the runner initiates malicious contact upon the catcher. 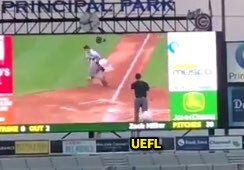 The camera angle from beyond third base along the stands in foul ground indicates the runner targeted the catcher for collision, which renders the resulting contact malicious. Pursuant to Rule 8-4-2e, malicious contact supersedes the obstruction, which means the runner should be declared out as in 8-4-2e, and ejected from the game.